Neolttwigi: A Korean Seesaw Game. Neolttwigi is a traditional Korean pastime for women and girls that usually happens around the holidays and during the winter months. 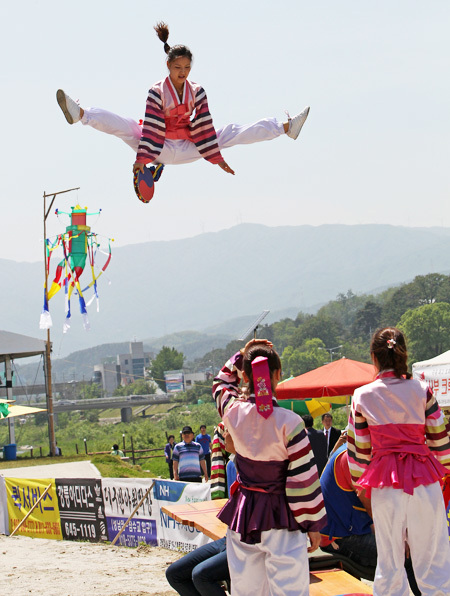 It is often called a Korean seesaw, but it differs from the usual playground version in that the fulcrum, or pivot point, is not attached and that it is played standing up. The fulcrum used to be a rolled up straw mat, or even a pile of dirt, although nowadays a sturdy wooden block is often used. The plank of wood could be varying lengths, but usually was between 2 and 2.4 meters. To aid in stabilizing the plank sometimes someone would sit on the fulcrum as seen in the image above. 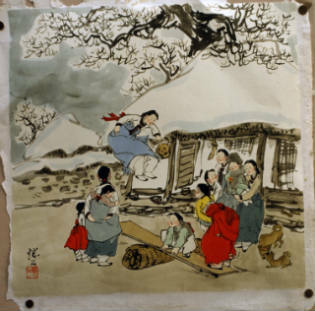 It is not really known when women started playing Neolttwigi, although a famous scholar Yu Deuk Gong (1749-1807) noted in his book Customs of the Capital that “envoys from the Ryukyu Islands learned about this pastime when they came to pay tribute to early Joseon Kings” and that they then took the custom home with them. Ryukyuan envoys are recorded as paying tribute from the late Goryeo period up until the late 16th century. Also there is a popular belief that Neolttwigi was played during the Goryeo period to improve women’s health. With these two clues it seems likely that Neolttwigi has been around at least 600 years and probably more. Neolttwigi is actually not easy to play as the balancing on the plank and jumping is quite tricky and somewhat strenuous, plus if you take into account that usually the players are dressed in their best hanboks you may wonder why it has such a long history as a pastime. This is said to be because the houses of the yangban or nobles had walls around their houses and women were often not allowed to go outside the walls. This meant that they had very little idea of what was going on beyond the walls of their confinement. Once they discovered Neolttwigi it was a perfect way to catch tiny glimpses of what was going on just beyond their walls. The game could be set up in any open space and required very little equipment or set up time which made it even better. Women, however, weren’t able to use it all the time as their usual daily routines often didn’t allow them much free time, so the game became popular on holidays and during the winter when there wasn’t as much to do. Women dressed up, and wore their jewelry and makeup, to play because if they jumped high enough to look out, that also meant that anyone outside the walls could look and see them There are a few pastoral poems that describe women jumping high enough for suitors to see them and perhaps to fall in love with them. To jump high you have to be quite athletic, have good balance and have a good partner on the other end of the plank. Women would use a sash to tie their hanboks hitched up to make tripping less likely, and would wear jewelry that would catch the eye and make jingling sounds. Neolttwigi was often a group game with women singing songs and exchanging turns while no doubt gossiping about all they had seen beyond the walls. “A woman with a purple skirt steps out. Her feet are exposed. I glance and see a maiden with slicked back hair. Hers is a radiant face. I’m in ecstasy just looking at the women at play, so who is to blame?” From a poem by Nakha Yi Hakgyu. I wonder if the women knew how the men watching felt, since this is not the only poem extolling the attractiveness of women playing Neolttwigi. As time passed women also began to do tricks, such as lifting a leg while in the air or turning around, and this developed into acrobatic performances. Nowadays Neolttwigi is pretty much relegated to Folk Museums and Villages, although it does sometimes appear in Sageuk, and at the bigger Folk Festivals. I’ve never tried it, but perhaps one day I’ll be able to. You may also like Ssireum, Geune Ttwigi, Tuho, and Paengi. ← Seoul Bamdokkaebi Night Markets.